As the smallest member of the Mercedes-Benz line, the A-Class has had a tough time earning much credibility or respect. That could change, though, if the German automaker were able to inject a dose of stylishness and sportiness into the next design, and it appears it may be doing exactly that. 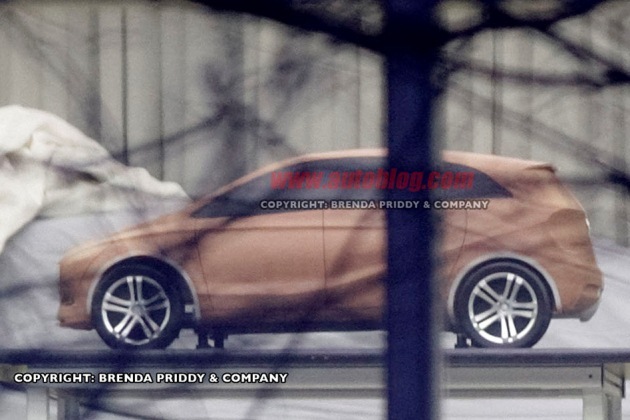 Spy photographers managed to snap off a set of images that appear to show a quarter-scale styling buck of the next-gen A-Class (codename W176), and it's much lower and more agressive than ever before, complete with some 2012 CLS in the flanks and fascia. As you can see from the green car in the background, Mercedes-Benz appears to be using its BlueZero F-Cell Concept as a basis for the small hatchback's overall proportions. Rumor has it that Mercedes-Benz will incorporate thee- and five-door models into the A-Class pipeline, along with a possible crossover to take on the likes of the BMW X1. There could even be an AMG version of the little front-wheel drive machine, with as much as 270 horsepower. Reports indicate that the next B-Class will be based on the same architecture. [source: Brenda Priddy & Company]Spy Shots: 2012 Mercedes-Benz A-Class styling buck caught in the buff originally appeared on Autoblog on Tue, 25 Jan 2011 15:32:00 EST. Please see our terms for use of feeds.